Over the past few decades, there have been several research papers in the scientific press that submit there is a correlation between cosmic-solar radiations and destructive geological events such as earthquakes and volcanic eruptions. 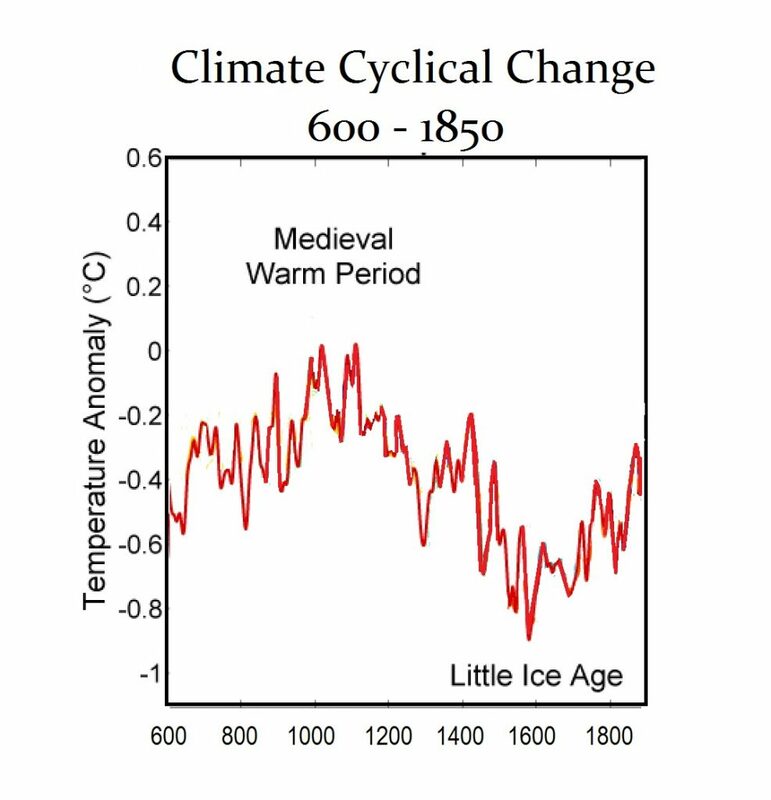 On top of this, there are correlations with climate change that kick in where volcanoes throw up ash into the atmosphere which blocks the sun and that sets in motion the global cooling sending the earth back toward an Ice Age. Therefore, the entire process is extremely complex. Our computer can put out a forecast, but it is looking at everything and the dynamic complexity of all the interactions. This is why I do not put forth X happens because of Y. It is just more complex than such correlations. Nonetheless, the strongest correlation between volcanoes and earthquakes remains that with the sun. In the last two and half centuries the following major volcanic eruptions occurred during strong solar minimum when the energy is at its greatest: Grimvotn (Iceland) 1783/84 (14 km3), Tambora (Indonesia) 1810 (150 km3), Krakatoa 1883 (5.0 km3), Santa Maria (Guatemala) 1902 (4.8 km3), Novarupta (Alaska) 1912 (3.4 km3). The only major eruption to occur during a solar maximum was Pinatabo (Philippines) 1991 (between 6 and 16 km3). Additionally, research has concluded that there is an extremely high correlation between global volcanic activity among the largest of classes of eruptions and solar activity lows. Over 80% of these volcanic eruptions greater than VEI 5 and almost 88% of the extreme largest eruptions measuring VEI 6 or greater also taking place with solar minimums. There appears to be a strong correlation of volcanic eruptions coinciding with solar minimum. Pictured above, the Bali, Indonesian Agung volcano has been putting out smoke for several weeks. If this eruption unfolds as a VEI 6+ or VEI 7 as was Tambora back in 1815, this will accelerate the Global Cooling. That is going to be devastating for society and the global economy. There is a clear relationship between solar magnetic activity and 11 of the most explosive eruptions from silicate-rich volcanoes in Japan over the past 309.6 years. It turns out that nine of these eruptions, in fact, took place during solar minimum, which is the inactive phase of solar activity/sunspots. We may find that volcanoes are also triggered by the by the rise in cosmic radiation. What I can confirm is that volcanic eruptions play a tremendous part in creating Global Cooling, which is our real threat going into the next decade. Volcanic activity is rising again from Mount Tambora to Yellowstone. 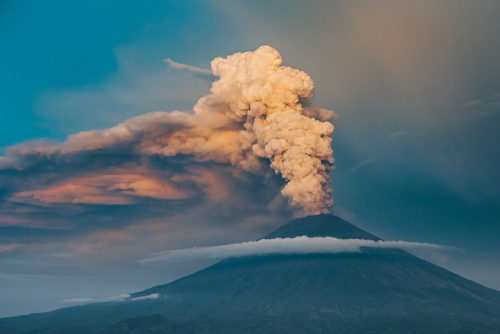 Evidence suggests that 1816, known as the year without a summer, was caused predominantly by a volcanic winter event caused by the massive 1815 eruption of Mount Tambora, which was the largest eruption in at least 1,300 years. 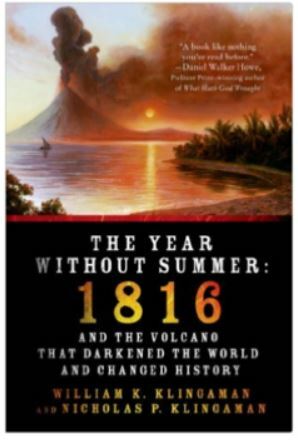 However, the Year Without a Summer was exacerbated by the 1814 eruption of Mayon in the Philippines. Once again, it appears that there is a correlation of not just one volcanic eruption, but a series. 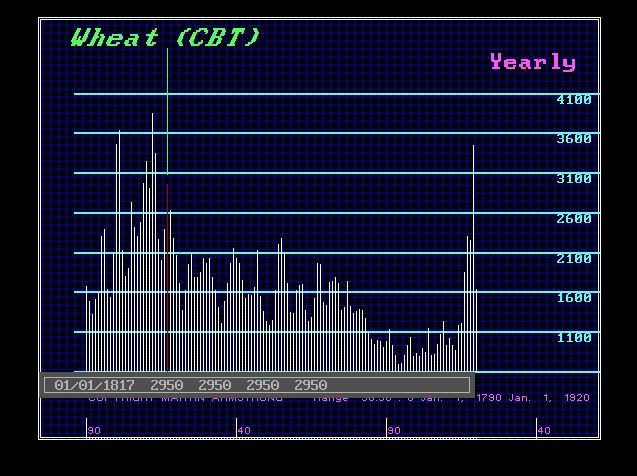 Wheat prices had peaked in 1812 due to war, but they declined in 1815 falling to $19.90. They then rallied sharply into 1817 reaching about $30 posting a 50% advance. In Britain, the farmers tried to prevent the price of wheat from declining. They essentially paid off the politicians to introduce the Corn Laws which were tariffs and restrictions on imported food and grain (“corn”). The Corn Laws were enforced in Great Britain between 1815 and 1846. They were designed to keep grain prices high to favor domestic producers against the American farmers in the aftermath of the War of 1812. The Corn Laws imposed steep import duties and thereby made it too expensive to import grain from America, which set in motion famine conditions when food supplies were short. This attempt by the British government to protect their farmers from competition became a leading cause of the Great Irish Potatoe Famine. Beginning from 1845 to 1851, the Irish potato famine killed over a million men, women, and children. This is what caused over a million more to flee the country sailing to America where food was plenty. Ireland in the mid-1800s was an agricultural nation, populated by eight million people who were among the poorest people in the Western World. The cause of famine was potato blight, which devastated the crops throughout Europe during the 1840s. However, the impact in Ireland was overwhelming since about one-third of the population was dependent on the potato. The Corn Laws contributed to the disaster by blocking the importation of food. They were abandoned because of the Irish situation in 1846. If we look back in time through the historical record, we discover another period where there appears to be a major convergence of volcanic activity which creates Global Cooling and the subsequent famine. There were the great volcanic eruptions that created the extreme weather events of 535–536AD during the reign of the Byzantine Emperor Justinian I (527-565AD). A mysterious cloud appeared over the Mediterranean basin according to the historian Procopius of Caesarea (Procopius Caesarensis; c. 500-560 AD) who wrote: “The sun gave forth its light without brightness, and it seemed exceedingly like the sun in eclipse, for the beams it shed were not clear.” This was a volcanic cloud that blocked the sun. But it was not a volcano in that region. The cloud’s appearance created a climate cooling for more than a decade. Crops failed, and there was widespread famine. This also sets in motion a pandemic known as the Plague of Justinian (541-542), which swept through the Eastern Roman Empire killing 5,000 people per day in Constantinople. The dating of this is extremely close to the famous civil unrest known as the Nika Revolt of 532 AD, which preceded the cloud account of Procopius and the plague. Scientists had postulated that the Global Cooling set in motion by a giant volcanic winter 535-536AD may have been the result of the eruption of Ilopango in El Salvador, which filled Earth’s atmosphere with ash as did Mount Tambora in 1815. However, as the SMITHSONIAN reported back in 2010, “researchers say there were two eruptions—one in 535 or 536 in the northern hemisphere and another in 539 or 540 in the tropics—that kept temperatures in the north cool until 550.” This has emerged from studying the ice core samples collected in Antarctica and Greenland with data from tree rings. According to the correlation of this data, “nearly all extreme summer cooling events in the northern hemisphere in the past 2,500 years can be traced to volcanoes,” reported the Smithsonian. There has been a lot recently written about the danger of a Supervolcano at Yellowstone. In fact, scientists discovered a tremendous blob of magma stored beneath Yellowstone, a blob that if released could fill the Grand Canyon 11 times over, the researchers reported on April 23, 2013, in the journal Science. The latest of the trio of Supervolcano eruptions created the park’s huge crater, measuring 30 by 45 miles across (48 by 72 kilometers). Correlating this with our database suggests that there is a more likely alignment with the flipping of the poles every 720,000 years, which we went into in great detail in the Mayan Report – Supernatural Side Roads. If we assume the 8.6-year cycle applies to this type of event given even the precession of the Equinox is a derivative 25,800 years (3×8.6), then we should see key markers along the way about every 224 years. If we look backward in time, we look to 1705BC, which was followed by the eruption of Thera (Santorini) which destroyed the Minoan Empire. 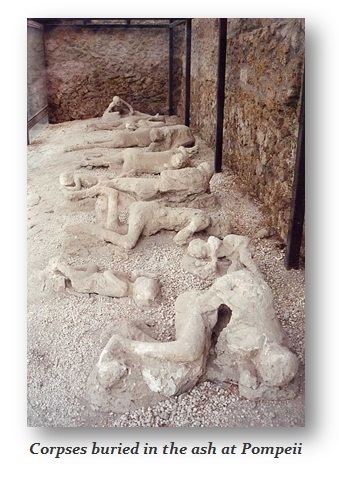 Two cycles back from 535 brings us to 87AD, which was a period that also marked the eruption of Vesuvius in 79 AD is probably the best known volcanic eruption in world history since it buried Pompeii and Herculaneum. Looking at 224 intervals moving forward in time. there is evidence of unusually high levels of Carbon 14 discovered in tree rings throughout Japan from this period around 759AD, the next target after 535-536AD. The high Carbon 14 trace from this period has suggested that there was at least a gamma-ray burst from the sun. The next target would be about 983AD bringing us to the great Medieval Warm Period (MWP) when the climate turned back up into a warm climate for the North Atlantic region. This lasted into about 1200AD. The next target would be 1207 is perhaps the beginning of the Little Ice Age. Thereafter, the next target period begins 1431, followed by 1655, 1879, which was followed by the Krakatoa eruption in 1883 (VEI 6). We also have a VEI 3 event at Cotopaxi, Ecuador in 1877. 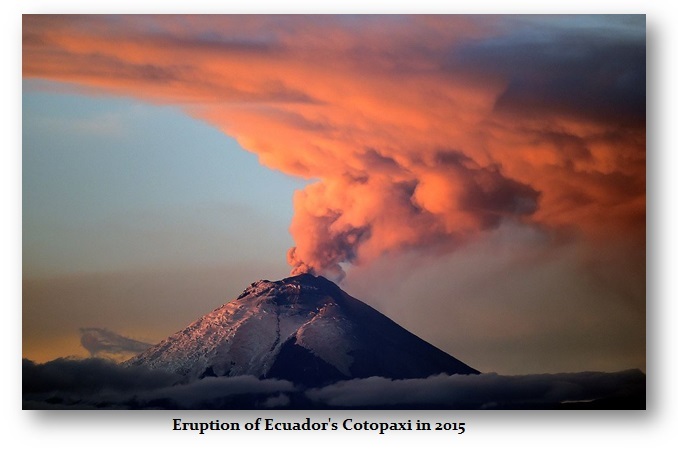 Cotopaxi has begun to erupt in 2015 while the island that once hosted Krakatoa was completely destroyed in the eruption in 1883, new eruptions began in December 1927 which rebuilt the Anak Krakatau (“Child of Krakatau”) cone in the center of the caldera. Anak Krakatau sporadically comes to life, building a new island in the shadow of its parent. The next major target would be 2103 for a massive correlation. Tambora has also come alive since 2011. Radar Images provided by the International Earthquake and Volcano Prediction Center in Florida, show the hot areas. 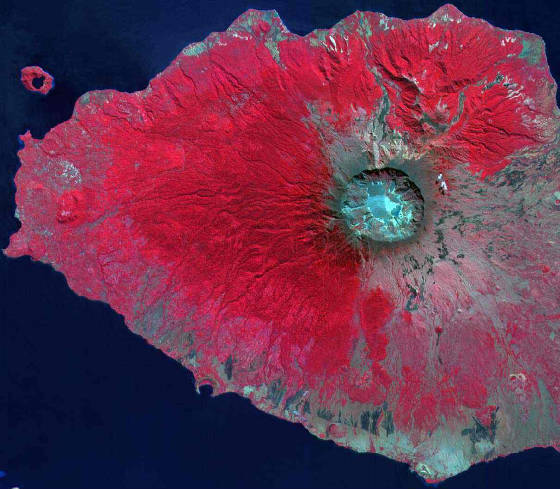 This volcano is also on the watch list for an eruption once again. There has been a sequence of earthquakes that began shaking the island with increasing frequency since April 2011. Columns of ash have already been venting as high as 4,600 feet. If we see a series of volcanic eruptions in the VEI 6 category or greater within 2018, expect to see a very sharp turn down in temperature and Global Cooling will take on rapid change going into 2024.